Each of the world's automakers spends heavily developing its own four-cylinder engine. That's a sure sign that the industry's business model is broken, says Sergio Marchionne, CEO of Fiat Chrysler Automobiles. The engines are very similar, he said. "Consumers could not give a flying leap" about whose four-cylinder engine is in a vehicle. Besides four-cylinder engines, automakers could share spending on many other similar systems and vehicles. "We need to find an alternative business model for this business," Marchionne said during a conference call with analysts last week. "We are involved in this incredible battle for survival that adds no value." The solution, he said, is consolidation among automakers. And if automakers won't consolidate voluntarily, the capital markets should force change upon them, the FCA boss argued. "There is a fundamental problem that can't be ignored," Marchionne said from Brazil, where FCA just opened a plant to build the Jeep Renegade and up to two other models. Marchionne singled out Toyota Motor Corp. and Volkswagen Group as being the most effective among mass market automakers at returning value to shareholders through effective use of capital. But he said even the performance of those companies pales next to other industries. "The capital consumption rate doesn't deliver value to the consumer, and in its purest form is economic waste," Marchionne said. "It's just bizarre." In an analysis he titled "Confessions of a Capital Junkie," Marchionne said automakers could potentially share 40 to 50 percent of vehicle development costs, returning 2.5 billion to 4.5 billion euros ($2.78 billion to $5.01 billion) of capital to shareholders every year. 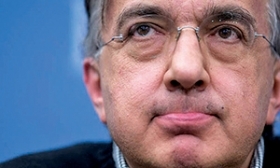 Marchionne has been loudly courting potential global partners for FCA for several months, without success. Analysts on the call pushed back when Marchionne suggested that the capital markets could force automakers to change their ways or consolidate. "The capital markets are not going to be able to do anything like this," argued Max Warburton of Sanford C. Bernstein & Co., an industry analyst in Singapore who issued a report on FCA's low profit margins last month. "There are probably five or 10 men [in the auto industry] that are able to do this, and you probably have them all on speed dial." The exchange between Marchionne and Warburton grew testy at times. Marchionne said: "Don't shy away from your obligation. Your obligation at the end of the day is to direct the flow of capital. That's what you do for a living. I make cars, you direct capital. Own the responsibility, Max." Marchionne added: "I think the capital markets need to take responsibility for forcing capital in a responsible way. In the way you wrote [the report] you've relegated us to a valuation that is obscene. How far down the food chain do we need to go to be embarrassed?" n Acknowledged that it increased the wholesale prices of its vehicles to dealers but didn't raise the sticker prices. n Said it is working to "improve the mix" in its pickup lineup to boost profits, and it is working to remove what CFO Richard Palmer called "deep bottlenecks" in its supply base that is restricting certain pickup sales. Palmer did not indicate what components he was referring to, but Ram brand head Bob Hegbloom has said the brand plans to expand its profitable light-duty diesel offerings to 20 percent of its half-ton mix.